From Charlene Lo’s North Shore condo, you can see the skyline across Vancouver Harbour. Inside, the decor is modern: bright neutral tones complemented by rich texture. It feels like an urban oasis. It’s exactly the type of condo where I’d love to live, if I didn’t despise city living. But for Charlene and her partner Chris, their home strikes the perfect balance. It’s close enough for Charlene to reach Hollyhock’s Gastown office in thirty minutes, and it’s only six hours from their beloved tiny home on Cortes Island. Here on Cortes, Charlene’s home has a very different feel. Instead of bright white, the walls are panelled in knotted pine with mahogany casings. Large windows overlook trees instead of concrete towers. The leaf-patterned curtains are rarely closed. Tucked in the corner, a yellow velvet couch sits strewn with meditation pillows. Their vibrant colour add a sense of whimsy to the otherwise earthy palette. Away from metropolitan life, this 240 square foot space is a creative refuge, nestled in the quiet of alder trees. Charlene moved from Toronto to the west coast in 2016 to become Hollyhock’s Communication and Program Director. Back then, as I welcomed her to our team, I only knew a handful of things about her: she loved dark chocolate, she was a vegetarian, she was a certified Ashtanga Yoga instructor, and she could speak conversational Cantonese. They were the kind of things you’d learn from a public biography or online dating profile. Surface stuff. But, once we began to work side-by-side, I came to know her quirks and foibles so much better. Charlene pours her heart into her work. When she manages to land an accomplished presenter for the season, her eyes fill with glee. When a new program (a wild card booking) sells out, her joy spreads even faster than the announcement itself. Conversely, when bad news crosses her desk, the glimmer in her eyes fades, sometimes for days. But, even then, she still shows up, in the heat of conflict or the aftermath of personal tragedy. I admire that, a lot. Charlene’s face is an open book, much like my own. In fact, we share so many personality quirks that we naturally grew closer after I left Hollyhock. Now, she’s a dear friend. She shares my love of naming inanimate objects. Halo, her tiny house, is a portmanteau of her partner’s surname “Hakes,” merged with her own, “Lo.” From my tiny cabin a hundred yards away, I often see her bike, Betty, parked out front, or Sally, Charlene’s paddleboard, harnessed on top of their car, aptly named: The Green Comet. I’m always sure to refer to them by name. It’s just the polite thing to do. Despite being twelve years older, Charlene’s youthful spirit surpasses my own. She is full of curiosity and vigour for life. I often find her in the company of children, who climb her small frame like a tree. When my partner, Charlie Hughes, taught her how to chop kindling to fuel her wood stove, Charlene delightedly began referring to herself as “lumber Jill.” And In the summer when Hollyhock is in full-swing, Charlene jogs the trails to work. It’s how she recharges during that busy season: a wild moment in nature. Along with her vibrant spirit, Charlene holds space with deep authenticity. With her, a simple cup of tea transforms into a three hour conversation about our deepest desires. Her insights make me feel as if a wiser version of myself is sitting across the table. It feels good to be heard. Charlene never tells me that I’m taking things “too seriously.” Even if I am. She just listens. And if need be, she replaces our teacups with Bourbon-Buchas, a cocktail of her own making infused with ginger kombucha. Today we stick to tea, as I guide Charlene to lean against the window. It’s the beginning of January, the month of New Year’s resolutions. For me that means choosing a word to guide me for the next 365 days. Last year I chose “value.” The word challenged me to look at myself with a fresh perspective. 2018 was a hard year for Charlene. It taught her the meaning of resiliency. “Do you have any New Year’s resolutions for 2019?” I ask her, curious if she has set her intention on something in particular. Charlene opens her Macbook and shows me the webpage. It shows Mara holding a bouquet of silver dollar eucalyptus. I smile. Eucalyptus is one of my favourite plants, and its silver dollar leaves will definitely play a part in my rebrand this year. I ask Charlene to leave the webpage open. I place a framed mirror beside her on the desk before tucking myself into the corner of her tiny space. Sunlight shines softly through the window. It contours her face in the mirror. I get the shot, but don’t show it to her. I usually allow my clients to see some of the photos during our session, it helps them gain confidence. But I know Charlene too well. For her, it will do the opposite. Together, we move her yellow velvet couch away from the wall and closer to the window. Sitting on it’s edge, Charlene looks out to her new bathhouse. It’s still under construction, but soon it will house the heavy claw-foot tub that requires four people to move. When Charlene and Chris purchased their tiny home in fall 2017 it was unfinished. They laid the hardwood, constructed an outhouse from wooden pallets, and designed a rainwater collection system. With this bathhouse, their Cortes home will finally be complete. “Almost there,” she says, looking out at the framed structure. We decide to finish our session outside, along the trails that Charlene runs to work during the warmer months. She prances up the ladder to the loft. The ceiling is too low for her to stand-up, but it’s the perfect height to lay in bed and soak in the quiet of night. 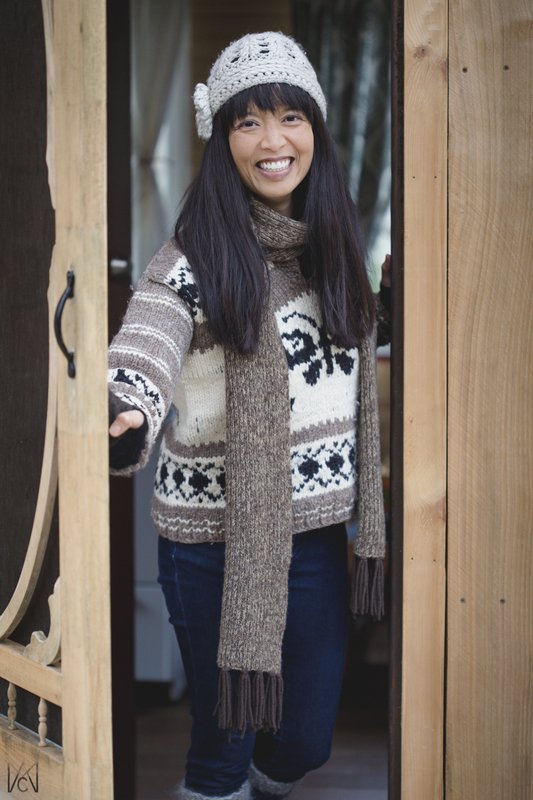 Charlene chooses a cowichan sweater and striped calf warmers. On top, she layers a thick scarf, fingerless mitts, and a toque with a large knit flower on it. Her outfit is practical, yet adorable. It suits her perfectly. Outside, Charlene’s energy is refreshed. This is why she loves Cortes: the magnificence of nature is just a step away, outside her front door. We wander up the road and into Siskin trail. The forest glows with a diffused winter light. As we walk, Charlene stops in front of a large old-growth cedar. “I love this tree,” Charlene shares, “I think it’s my favourite tree on the island.” She rests her fingers upon its massive trunk. There is something deeply humbling about standing beside an old growth tree. It has witnessed so much. To this enormous old tree, Charlene and I are just a passing figment. Some old growth still remains in Vancouver, but they seem diminished by the gaudy grandeur of high rises and city lights. I suppose that’s why Charlene finds so much peace here and why people happily take the pilgrimage to Hollyhock each summer. Vancouver might offer restaurants, convenience, excitement, and connection, but on Cortes, and in her tiny home Halo, Charlene can reacquaint herself with the universe.